Flip chicken over on its breast side. Using poultry scissors cut along both sides of backbone. Press down to flatten the bird. Heat 12” non-stick cast iron pan over medium high heat and add 1 tablespoon of olive oil to the pan. Rub the chicken with 1 tablespoon of olive oil and generously season the chicken with salt and fresh ground pepper on both sides. Place the chicken skin side down into cast iron. Cook the skin until it starts to crisp on the edges and the color is golden brown. Flip the chicken over and add the garlic, rosemary, and thyme to the pan. 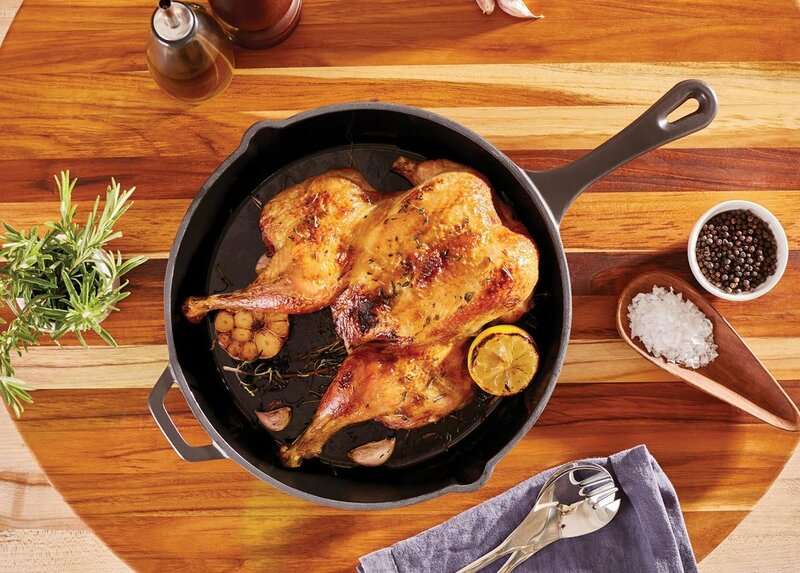 Place 12”` non-stick cast iron in the oven, and roast chicken skin side up for 30 – 40 minutes. Using a thermometer, check the temperature so that the thickest part of the thigh reads around 160˚F. Let rest for 10 – 15 minutes. Carve and serve. A good way of ensuring crispy skin is to place a heavy bottom pan directly on top of the chicken for the first couple of minutes of cooking. Ask your butcher to complete step #3 when purchasing. During cooking you can baste the chicken with pan juices.